Seriously guys, my life changed when I put together this low carb pizza dough recipe. Because the only craving I had when switching to low carb foods was pizza. And this low carb pizza dough put and END to that! It’s as close as I’ve come to the real thing, except without carbs. 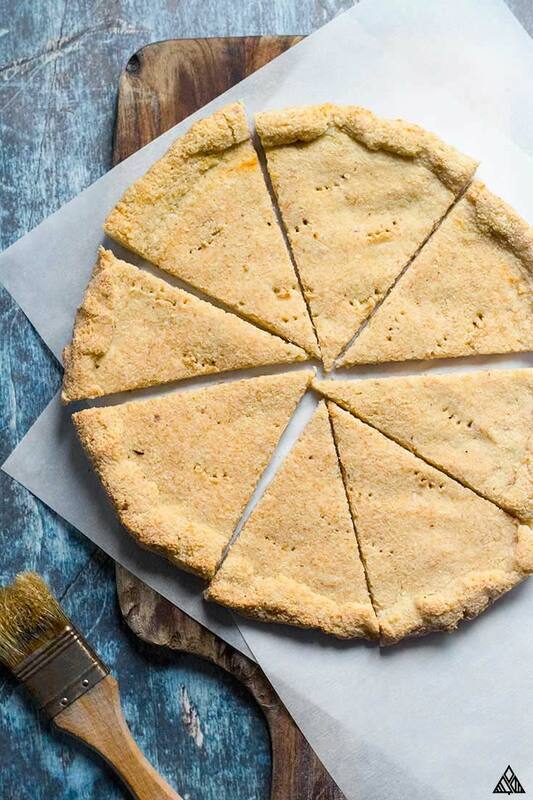 The psyllium husk powder makes the dough nice a fluffy, while the almond flour is the perfect substitute for wheat. 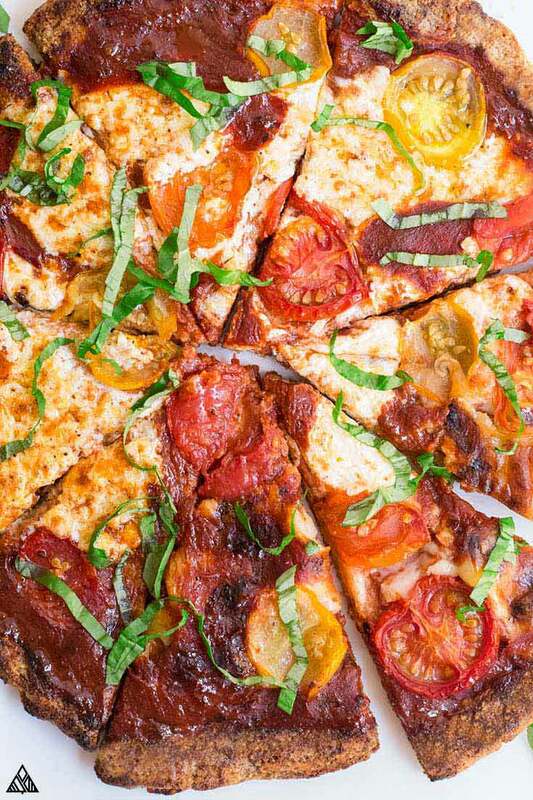 Cover this low carb pizza with your favorite toppings and you’ll never miss bread again. So turn on that oven and let’s get tossing! Most low carb pizza dough recipes use cheese and cream cheese as the main ingredients, which I don’t understand! Because you still put cheese on top — so you’re basically eating a ball of cheese with an egg mixed into it. Don’t get me wrong, I love cheese more than most, but as an addition to low carb recipes, not for entire low carb meals! So I skipped the cheese in this low carb pizza dough and kept the ingredient list pretty simple: almond flour, baking powder, salt, psyllium husk powder, apple cider vinegar and water. Homemade almond flour (if you followed my how to make almond flour tutorial) doesn’t work for this recipe, as it’s less fine when compared to store bought products. 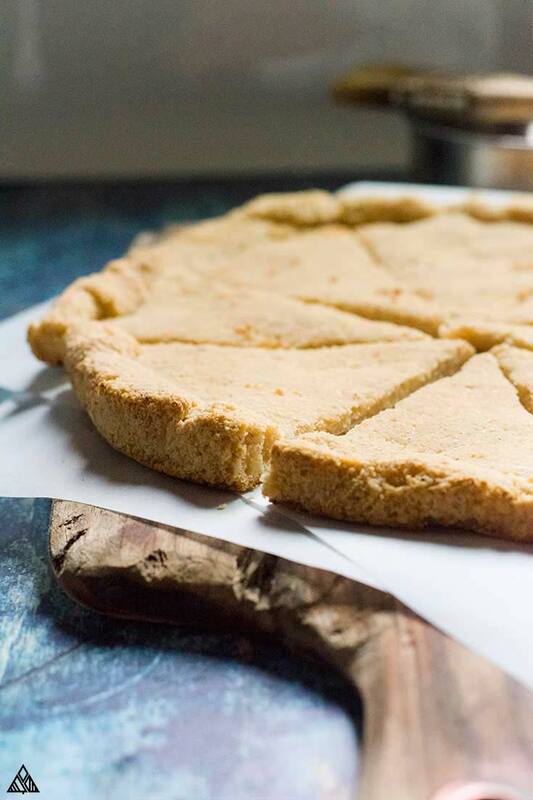 I prefer almond flour to coconut flour pizza crust, as coconut flour tasty pretty dry in comparison. I also enjoy low carb pizza crust cauliflower, but felt it had a strong keto vegetables taste. You may have heard of this ingredient, in *ahem* digestive aid products, but don’t worry. 1 teaspoon contains 3 grams of fiber, making it low in net carbs (great for those sticking to a keto foods list). This means there are 18 grams of fiber in our entire low carb pizza dough recipe. Stick to a serving size and you should be good. Psyllium husk is an incredibly important low carb foods list item, as low carb flour doesn’t have the same binding capabilities as gluten. This results in a “crumby” and dense product. This is where psyllium husk comes in — it’s full of soluble fiber, which absorbs moisture while adding structure and “fluff” to our low carb pizza dough. *According to Bob’s Red Mill, psyllium husk should be consumed with a full glass of water. May seem odd, but water is absorbed by psyllium husk to work it’s magic in our low carb pizza dough. Combine the dry low carb pizza crust ingredients together in a bowl. Then we’ll stir in the water and apple cider vinegar. Once combines, form a ball with the low carb pizza dough and set it aside for about 5 minutes, for moisture to absorb and the low carb bread to “grow” a bit. You can roll out your low carb pizza recipe one of two way. With your hands. 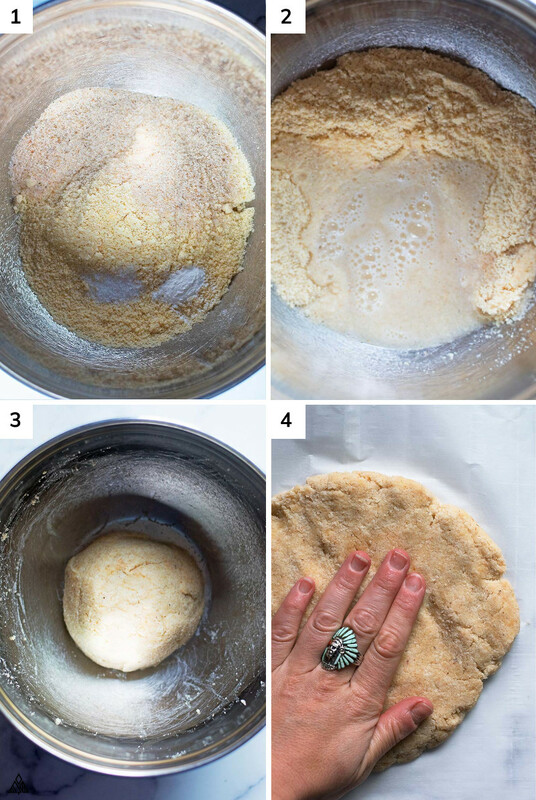 Place a piece of parchment down, put your low carb pizza dough on top, and press the dough into a circle using damp hands (otherwise the dough will become too sticky to work with). I prefer this method as it allows me to smooth out any cracks and form the dough into the exact shape I’d like to make. Between 2 sheets of parchment paper. This method is less messy, but also less precise. Sandwich your low carb pizza dough between two sheets of parchment and roll it out using a rolling pin. I still suggest you dampen your hands and smooth out any cracks that have formed in the dough before baking. 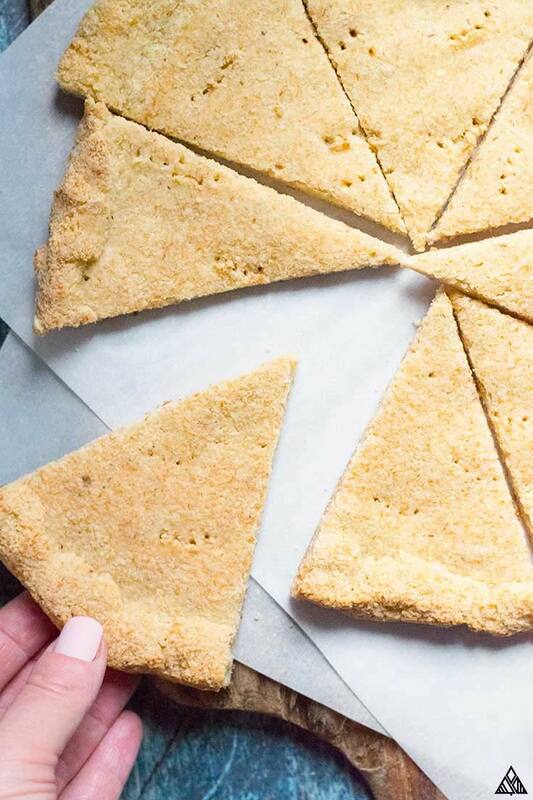 This low carb pizza dough is PERFECT for making a folded crust, just like traditional pizza. 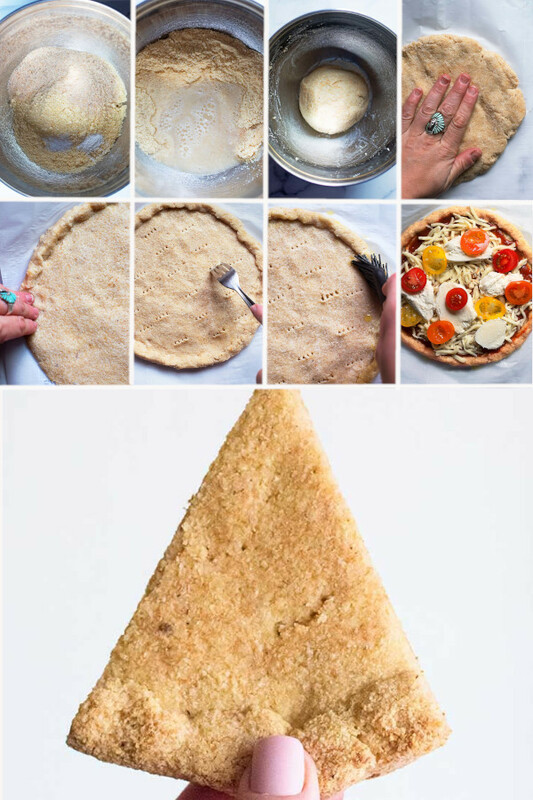 A lot of my keto pizza crust recipes are harder to fold than this one. Dampen your hands and fold the edges over all the way around the pizza. Again, I like to smooth out any cracks that form in the low carb pizza dough. 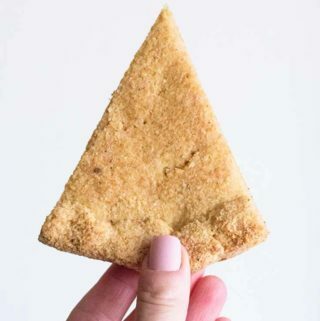 *This step is optional — only use if you’d enjoy a folded crust. Use a fork to puncture holes throughout the crust, this will prevent it from forming large bubbles as it bakes! You’ll also want to use a pastry brush to cover the crust in olive oil — this prevents it from burning. I like to start with low carb pizza sauce, because if you didn’t know, most store bought products are LOADED in sugar and cornstarch. Don’t believe me? Check out the label next time you grab a jar. Alternatively, you can use pesto, low carb BBQ sauce, or whatever you’re craving! And now the toppings. Protein is always a great choice — sausage, pepperoni, chicken, etc. Low carb vegetables such as bell peppers, onions, spinach, mushrooms and olives are also delicious. Get creative and enjoy! Toss your keto pizza in the oven and bake it on up! Your pizza will be done in about 20 minutes — the cheese should look golden brown and melted and the crust should be cooked through. If your toppings are done before the crust, simply cover you low carb pizza dough with foil and pop it back in the oven until it’s cooked through. Add some herbs and spices to the low carb pizza dough. Think Italian seasoning, dried basil, garlic or oregano. 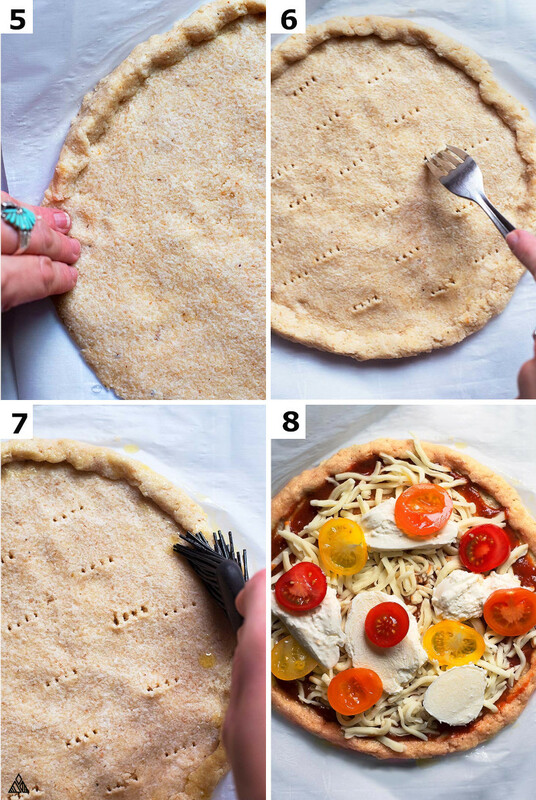 Make a cheese crust. Form your crust with cheese wrapped inside! Since there’s no low carb pizza crust Walmart sells, and low carb pizza delivery isn’t an option, homemade is the answer! Happy low carb pizza dough making my friends! Hope this recipe is the craving buster you’ve been looking for, let me know your thoughts in the comments below. 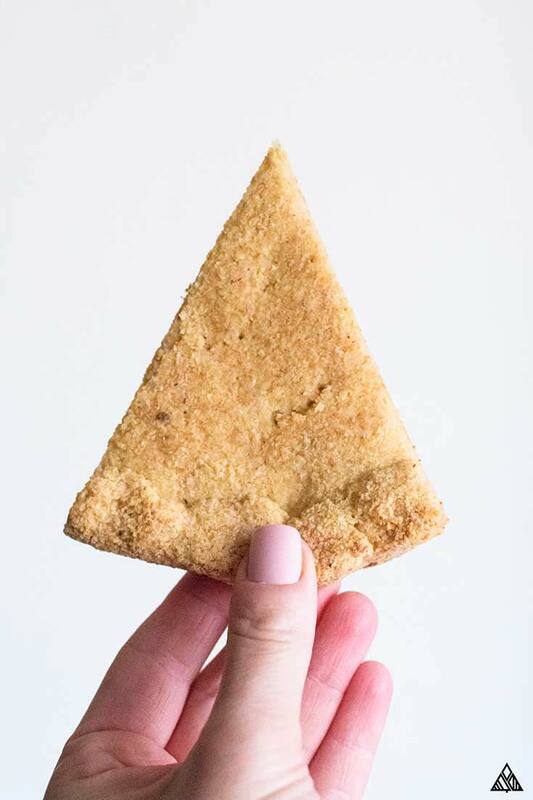 I am looking for a cracker , is this a recipe that could substitute for a cracker. to add a hummus or dip spread? how would I store it to keep it fresh. I would like to make several and freeze them.. This Pizza dough is so delicious I’ve made it 2 times already! My whole family is loving this <3 Thanks for such a great recipe!